Well this is a murky subject, if there ever was one. This is of course not intended to be the final word, just a simple guide for those – not at least my self – who tries to model these vehicles, without getting too much wrong. All classifications and "types" are entirely my own, and serve only pedagogical purposes. They have no correspondance in real life. When it comes to colours these can only be rough approximations. Different batches of paint, the effects of wear, tear, dust and weather etc, are factors that contribute to make any definitive identification of shades impossible. Anyone who has ever seen military vehicles in active service know how much they can differ in appearances. Scheme A (Battleship Camo): Medium Grey Overall. This is the earliest scheme, a Medium Grey or "Battleship Grey" all over, used up until the early autumn of 1916, before the tanks were used in active service for the first time (as we all know, at Flers, during the Somme battles). Some tanks may have used this scheme in action. Scheme B1 (Solomon Camo): Disruptive camouflage of Sand, Brown and Black over Medium Grey. 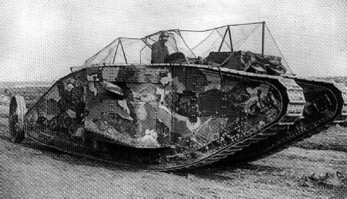 This was the standard scheme used by most tanks during the Somme battles in the autumn of 1916. It was actually devised by an artist, Solomon J. Solomon, member of the Royal Academy, but then doing service in the Royal Engineers. The colours were applied by hand and the patterns were very imaginative. This is how the war correspondent for The Times describes them, seeing them for the very first time on september the 13th, just two days before the battle: "The brutes were all painted in blotched reptilian colours, hues of rattlesnake and iguana, yellow and dull grey and black and mottled brown". It seems that only Mark I:s carried this colourful camouflage. Scheme B2: (Paving Camo) Disruptive camouflage of Sand, Brown and Black over Medium Grey. This was a variation of the standard scheme, introduced soon after the first tanks had landed in France, where each individual patch of colour was given a black outline, creating according to Fletcher, "a sort of crazy paving effect". Judging from photographs, this was not a standard camouflage pattern. B1 was more numerous. Scheme C: Dark Khaki Brown Overall. After the Somme, during 1917, the colourful scheme gave way completely to a new, Dark Khaki Brown Overall scheme. Ex-tanker Mitchell writes in his book: "The highly coloured painting was abandoned, and all tanks were henceforth of a neutral brown color". It should also be noted that excavated remains of tanks have been found to have traces of paint, traces that has been described as "dark khaki". This appears to have been the camouflage used up until the end of the war. Scheme D: Sand Colour Overall. Vehicles used in the Middle East and Mesopotamian Campaign are known to have been painted in a Sand colour. Quoting Jaques van den Hutte: It was a "richer more ochre shade than the 'stone' of World War Two. Just a little yellow ochre and brown paint mixed in the sand-yellow from the Humbrol military vehicle camouflage range achieves the effect". Hint: lettering was white on Khaki Brown vehicles and black on Sand painted ones. If the tanks used by the British in the Palestine Campaigns ever were painted Sand remains to be proved, though. REFERENCES: Fletcher: "Landships" p.17, Fletcher "The British Tanks 1915-19", p.54, 76, Pidgeon: "The Tanks at Flers" p.48, Mitchell: "Tank Warfare" p.45, Gibot-Gorczynski: "Following the Tanks" p.40, Jaques van den Hautte: "Military Model T" in Airfix Magazine April 1971. This was the basic scheme, used by the German Army during the whole war, the Field Grey being a Grey with a Greenish tint, that at first "was a darkish green with little grey", but "With use it faded to a lighter, greyer shade more recognised as Feldgrau" (Hundleby-Strasheim). This scheme is also in line with the German Armys standard camouflage, consisting of a three-colour camouflage, in general but not always soft-edged. (Colour Slides of an A7V that earlier was kept at the Aberdeen Proving Ground, and a German cigarette card, shows these three colours.) The Green seems to have been a sort of pale or mid-green - another expression used is "frosty green". The patches were on the large side. Used during the whole War. This is also a possibility, as blotches of Sand Colour were also used on other vehicles in the German Army. The Sand colour seems to have been a bit on the bright, yellowish side. (Hundleby talks of "clay-yellow".) Used during the whole War. The patches were rather small, in a sort of quilt pattern. This was a rare scheme. Scheme B4: Disruptive Camouflage of Pale Green over Field Grey. The Green colour was painted in a sort of thin, vertical flame-pattern. This variant was also uncommon. Introduced during the autumn of 1918, it differed from earlier schemes, not only in the number of colours used, but also in the schemes. Were the earlier schemes had been characterized by vague, mottled blotches, in the new scheme the paint was applied more in vertical bands, with hard colour edges, and stripes in black sometimes used as a demarcation between the different colours. This was an early camouflage used on captured British tanks, were the British Khaki was used as a base colour, on which jagged, angular bands of Feldgrau was applied, bands edged with black. This was the later standard scheme used on captured tanks - called Buntenfarben-Anstrich" - and consisted of equal, mediumsized, rounded patches of the four colours of Red Brown, Pale Green, Sand and Field Grey, often separated by thin black lines - in reality some 5cm wide. Research done by Mark Whitmore on the only surviving A7V, "Mephisto" in the Queensland Museum, Queensland, Australia, has showed that at least three distinct colour schemes were applied to Mephisto. First, Field grey overall at the time of manufacture. Second, prior to action at S:t Quentin, the main colour was still apparently "field grey" but rough stripes and patches of other, unspecified colours had been added. Third, between St Quentin and Villers-Bretonneux battles a camouflage, consisting of predominantly light brown patches, has been applied. Analysis of the paint done by the Queensland Museum indicates that it was of poor quality and would neither cover very effectively nor be long lasting. This could explain, at least partly, why eyewitnesses at the time of the capture of "Mephisto" recall indistinct colours. Rainer Strasheim, a world leading specialist on German WW1 armour, has the following to say: "Grey was THE colour of the German Army. But certainly not "Panzergrau" of WW2 vintage, the WW1 German artillery "dark grey" would perhaps best be described as a medium grey, like Humbrol 87, while motor vehicles usually had a still lighter colours, like Humbrol 40 or even Humbrol 28. And even the grey on one piece of equipment from one manufacturer may have changed considerably in tone through time - depending on availability of paints. Also, there were no rigid standards concerning paints when equipment was accepted by the army. The question remains, what was used on the A7Vs? After overhaul at the workshop, however, the base colour would almost certainly be a greenish tint, like Humbrol 80 or 120, which was also used as base colour on the captured Mk.IVs." Steven Zaloga writes thus in his "German Panzers 1914-18" (Osprey New Vanguard 127): "The predominant camouflage color for German heavy ordnance in World War I was feldgrau (field gray). However, the army did not rigorously enforce color standards and field gray ranged from a medium to dark gray as well as from a cold, neutral gray to a distinctly greenish shade of gray, much like the uniform color. Photographic evidence from the Daimler plant suggests that the first batch of ten A7V tanks were finished in a dark color that has been interpreted to be a dark green; most likely it was a decidedly greenish and dark shade of field gray. The second batch of AN tanks appear to have been finished in a more typical medium field gray. When issued to the troops, the vehicles were not camouflage painted. Camouflage paint began to be applied prior to the March 1918 battles, probably at Charleroi. The most probable colors were a clay yellow/ochre and red-brown/chocolate-brown colors. ... Evidence is scarce and the actual patterns employed on the tanks were not apparently based on any instructions but were improvised at Charleroi. In September 1918, a new Buntfarben-anstrich (multicolor paint) camouflage was ordered, usually painted in ochre, red-brown, and dark green and sometimes with the colors being divided by black lines. " 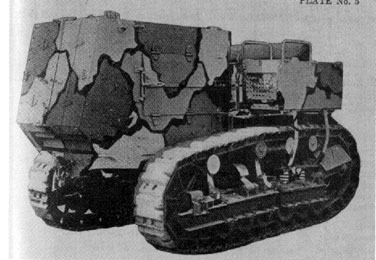 REFERENCES: Hundleby-Strasheim p.198-216, "The Tankette" no.4 vol.31 p.13, no.1 vol. 9 p.8, Nash "German Artillery 1914-1918", Schneider-Rasheim: "German Tanks in World War I", Mark Whitmore: “Mephisto” (book published by the Queensland Museum), Steve Zaloga: "German Panzers 1914-18" (Osprey New Vanguard 127). Overall Dark Green were used during the whole war, but it was not a standard scheme, but the normal coating that the AFV:s were given at the factory. Sometimes, when the vehicles were badly needed at the front, there were not time to camouflage them, so they were then used in this Factory Scheme. This colourful scheme was used mainly during 1917, the patterns being very fanciful – Steve Zaloga calling them "psychedelic" – with black sometimes used as a demarcation but mainly in streaks or "flames" here and there. Note that the Sand was Light Yellowish Cream in tone. During late 1917 and 1918 the same colours were used, but the patterns were often distinctly less wild, instead taking the form of either large, enlongated and more angular areas, or somewhat smaller angular areas or simply bands of Dark Green and Brown over the base Sand. The Black was used as a demarcation colour, sometimes between all colour areas – in the case of the scheme with smaller angular areas giving it the appearance of a sort of angular jigsaw puzzle – sometimes between only some. Sometimes the Black was dispensed with altogether, and sometimes only one colour were used on top of the standard Sand. This more simplified type of camouflage seems to have been used mainly during the later stages of the War. REFERENCES: "Zaloga: "The Renault FT Light Tank", p.43, Zaloga: "The Tank with Ugly Feet" in "Military Modelling" no.13 vol.30 p.38-39, "Armoured Fighting Vehicles of the World", vol.1 p.67. A no-frills Khaki or Overall Dark Green, with no camouflage pattern, appears to have been used during the whole War, and later, after the Revolution of 1917, also by the different White Forces in the Civil War. There is a strong possibilty that the Tsarist Army also used Soviet Army Scheme B, i.e. Light Grey overall. (See below.) See also this article by Tom Hillman! REFERENCES: "Armada" no.14, "Armoured Fighting Vehicles of the World", vol.1 p.11. At the time of the Revolution and Civil War Overall Light Grey was common. (Austin-Putilovs taken by the Poles were grey. A Surviving Austin-Putilov at the Lenin Museum in S:t Peterburg is also painted this way.). During the later stages of the Civil War and the first Years of Soviet Rule, on top of the the standard Dark Green coating were sometimes painted irregular hand-painted blotches of Light Green. The blotched areas had a hard demarcation outline and took fractal-like, rounded forms. See also this article by Tom Hillman! In the first years of the Soviet State there was no set standard for painting and marking armored vehicles, other than the one mentioned above. Tanks were painted in a plain green color, or two- or three-color camouflage schemes. The first regulations were not introduced until the spring of 1927. This stipulated that all armored vehicles of the RKKA (the official name of the Red Army: the “Red Army of the Workers and Peasants”) should be painted a olive light green color and sport a single symbol that identified the vehicle and its parent unit. For tanks the symbol was a triangle with a circle inside it, inside which was a square with a Roman numeral. (The number of the battalion, company, and platoon was codified by color: 1st red; 2nd white; 3rd black. Quoiting from Andrey Beskurnikovs and Mikhail Svirins excellent “The First Soviet Tanks (Armada Series No.1): “The color of the triangle signified the number of the battalion in the regiment; the color of the circle, the company in the battalion; and the color of the square, the platoon. The Roman numeral (I, II, or III) signified the number of the tank in the platoon. Company commanders did not have a number or square, There were no lines to separate the different colors (no outlines).” It was recommended that these markings should be carried on the sides, bow of the hull, and the rear of the turret. New regulations were introduced in 1929, when the standard colour was switched to a more dark-green hue. The marking standard was also changed, from black to white. New tactical markings were introduced: large white Arabic numerals 30 cm in height, and showed the number of the tank in the platoon. A coloured ring showed the battalion number (1st red, 2nd white, 3rd yellow. The number of the com­pany was written as a fraction: the company number being the numerator, the platoon number the denominator. There was still no special Winter Scheme, but AFV’s were overall green all the year around. To find out more, get the above mentioned really superb “The First Soviet Tanks” by Beskurnikov and Svirin. REFERENCES: Armada no.14, Zaloga: "The Renault FT Light Tank", p.44, Andrey Beskurnikov and Mikhail Svirin: “The First Soviet Tanks (Armada Series No.1). In this scheme (outlined by order in Ordonance Bulletin no.1867) there is no Base Colour per se. Instead it consists of irregular, angular blotches of Green, Dark Sand and Light Sand "separated by irregular black lines".The Dark Sand is defined in the order as "Deep Yellow", the Light Sand as "Light Cream". 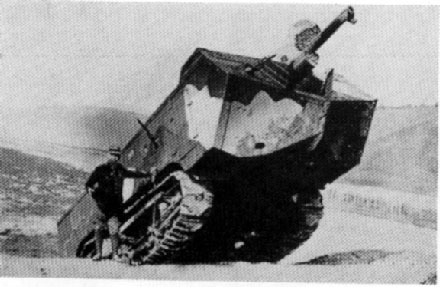 When the US Army used French vehicles, like the FT-17, they seemed to have used the original scheme – which seems to be French scheme B3 – that the tanks came in, not bothering to repaint them. REFERENCES: J.D. McKaughan: "US World War One Vehicle Camouflage", in "Museum Ordonance", September 1995, Zaloga: "The Renault FT Light Tank", p.46. This was the earliest scheme. The colour was probably slightly gloss in finish. This scheme followed in time after Scheme A: large hardedge wavy bands of Sand and Dark Brown over Dark Green. The bands did not follow any standard scheme. This scheme followed in time after Scheme B1: this time the Sand and Dark Brown over Dark Green took the shape of small patches. REFERENCES: Tauro Model kit "Fiat 3000 mod. 21 Ia serie". This is all I have been able to find. Suggestions anyone?